There are many landscape tools homeowners can use to control stormwater runoff, considered the largest source of pollution in Puget Sound. From planting trees to installing a rain garden or large cisterns, you can help minimize the excess rainwater runoff that washes toxic pollutants into Puget Sound each year. Every time it rains, water falling onto roofs, parking lots, driveways or hard-packed soil washes unfiltered into storm drains and directly into our streams, creeks, rivers and sound. The stormwater carries grease, oils, heavy metals, PCBs, flame retardants and other toxic pollutants into waterways. The excess runoff also causes flooding in streets and sewer systems to backup. What exactly is a rain garden and how do they help pollution? Rain gardens allow you to redirect rain from your roof into a shallow depression that filters, holds and absorbs water. By holding and infiltrating rainwater, rain gardens help protect our waterways and reduce flooding. These gardens can be shaped and sized to fit your yard. They also can be attractive landscape features, filled with native plants or other shrubs, trees and plantings that fit your soil, sun conditions and surroundings. 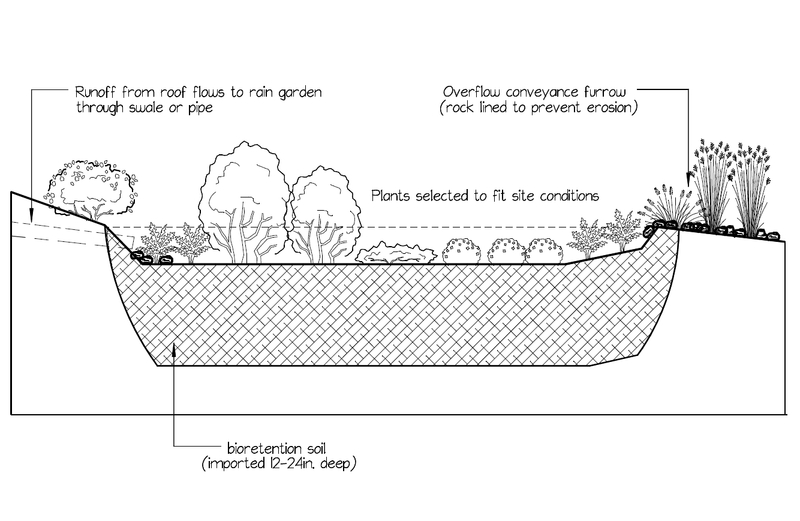 Typical rain garden layout in Seattle, Ecoyards LLC. Ecoyards can help you through the entire process, from designing a rain garden to constructing it to helping you maintain it. Our experienced staff will find the best spot for your garden, suggest the best plants for it and recommend ways to maintain it. Rain gardens are ideal for many properties that are fairly level (up to about 5 percent slope). 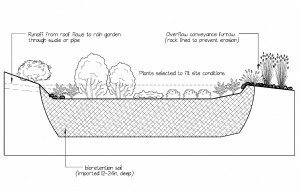 There should be a way for roof or driveway runoff to flow to the rain garden, whether over the yard or through a pipe or rock-filled ditch. We can help you determine where to install the garden and how big it should be. Ecoyards is a licensed landscape contractor with the city of Seattle’s Rainwise Rebate program. That innovative program will pay most of the cost of installing rain gardens and cisterns for eligible residents in Ballard, depending on how many square feet of roof runoff is controlled. (Check this map for the qualifying area). Residents can get rebates up to $4 per square foot of area that contributes to retaining runoff. The pilot rain garden rebate program was launched earlier this year in the Ballard neighborhood. You must hire a licensed contractor, such as Ecoyards, to do the work; the city isn’t currently giving rebates if homeowners do the work themselves. A Seattle Public Utilities inspector will do a pre- and post-inspection on site, and you must fill out the rebate form and send it in within 90 days of completion. Don’t worry, give us a call at 206-770-7879 or email us and we’ll help you figure it out.